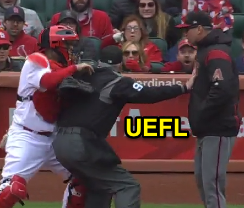 HP Umpire Tim Timmons ejected Diamondbacks Manager Torey Lovullo (strike one-two-three calls, preceded USC-NEC/fighting STL catcher Yadier Molina; QOCY) in the top of the 2nd inning of the Diamondbacks-Cardinals game. With none out and none on, Diamondbacks batter AJ Pollock took a 0-0 fastball from Cardinals pitcher Luke Weaver for a called first strike, 3-1 fastball for a called second strike, and 3-2 fastball for a called third strike. Replays indicate the 0-0 pitch was located over the outer edge of home plate and thigh high (px 0.859, pz 2.051), the 3-1 pitch was located over the outer half of home plate and waist high (px 0.530, pz 2.389), and the 3-2 pitch was located over the outer half of home plate and at the hollow of the knee (px 0.272, pz 1.448 [sz_bot 1.504 / MOE 1.421]), the call was correct. * At the time of the ejection, the game was tied, 0-0. The Diamondbacks ultimately won the contest, 4-1. This is Tim Timmons (95)'s first ejection of 2018. Tim Timmons now has 4 points in the UEFL Standings (0 Prev + 2 MLB + 2 Correct Call = 4). Crew Chief Mike Winters now has 0 points in Crew Division (-1 Previous + 1 Correct Call = 0). *Reason for ejection is Balls/Strikes, as Lovullo was already ejected before engaging Yadier Molina. *The 3-2 pitch was located 0.324 vertical inches from being deemed an incorrect call. This is the 10th ejection of the 2018 MLB regular season. This is the 5th Manager ejection of 2018. This is Arizona's 2nd ejection of 2018, 1st in the NL West (ARI 2; COL, LAD, SD, SF 0). This is Torey Lovullo's first ejection since August 20, 2017 (John Tumpane; QOC = U [Warnings]). This is Tim Timmons' first ejection since July 10, 2016 (Yunel Escobar; QOC = N-C [Check Swing]).